Happy Monday everyone! Today is a start of a brand-new week and the day-one of Air Asia 20% off on all flights! 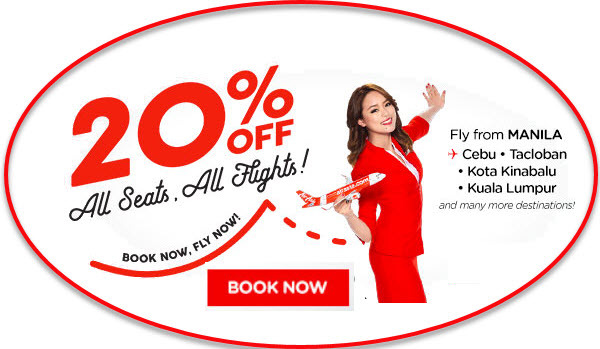 Yes, Air Asia’s 20% discount sale begins today. Book your flights now until July 16 to avail the sale tickets. Travel period for this promo starts July 17 and ends on November 23, 2017. To avail of the Air Asia promo, you need to book in advance. The 20% off applies only to the base fare. Thus, Value added tax is still to be added to the ticket. 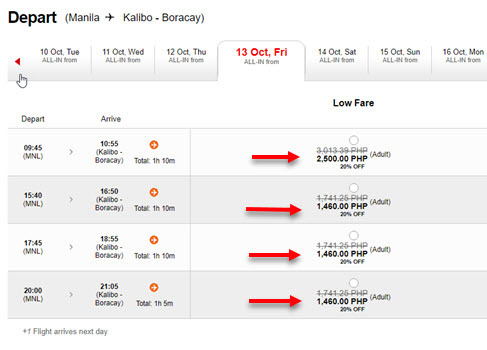 While booking your ticket you may also Air Asia Value Pack or Air Asia Premium Flex for a hassle- free flight. Included in the Value Pack are: 20 kilos baggage allowance, a meal, standard seat selection & travel insurance. The premium Flex on the other hand, cover free of charge in date/time of flight, xpress baggage and xpress boarding on top of the 20 kilos baggage allowance, a meal, standard seat selection & travel insurance. The Air Asia 20% off sale are only available via online booking at www.airasia.com or on the AirAsia Mobile App. In the Philippines, Air Asia has flights to Manila, Clark, Kalibo, Caticlan, Cebu, Tacloban, Tagbilaran, Puerto Princesa and Davao. For its international routes, Air Asia has direct flights to Hongkong, Kota Kinabalu, Kuala Lumpur, Macau, Seoul, Taiwan, Guangzhou, Shanghai and connecting flights to Australia, New Zealand, Brunie, Cambodia and several other Asian countries. The 20% off Air Asia seat sale is also available for Premium Flatbed. Air Asia sale tickets are limited and may not be available on peak periods. What are you waiting for? Book your flights now! For more promo fares and sale tickets of Air Asia, Philippine Airlines and Cebu Pacific Air, LIKE and FOLLOW us in Facebook: PISO FARE TICKET!